1. Tip the flour into a large mixing bowl, add the salt and sugar to one side of the bowl and the yeast to the other. Add the butter, eggs, milk and half the water. Use the fingers of one hand to mix the ingredients together. 2. Add the remaining water a little at a time until you have a soft, sticky dough and all the flour is incorporated. You may not need all the water. 3. Oil a clean work surface. Tip the dough onto the oil and begin to knead. Continue kneading for 10 minutes. The dough will become less sticky and feel smooth and silky when ready. Put the dough into a lightly oiled bowl. Cover until the dough has doubled in size. This will take between 1 - 3 hours. 4. Tip the dough onto a lightly floured surface and scatter the sultanas, mixed peel, orange zest, apple, pear and cinnamon on top. Knead in until evenly distributed throughout the dough. Place the dough back in the bowl and leave to rise for an hour. 5. Fold the dough inwards repeatedly until all the air is knocked out. Divide into 12 equal pieces and roll into balls. Place them fairly close together on one or two trays lined with parchment paper. Place each tray inside a clean plastic bag and leave to rise for one hour, or until double in size. 6. Preheat the oven to 220C, gas mark 7. For the crosses, mix the flour and water together to form a pipable paste. Using a piping bag fitted with a fine plain nozzle, pipe crosses on the buns. Bake for 20 minutes or until golden brown. 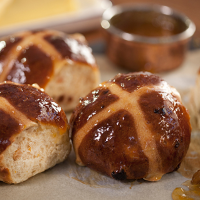 Mix the apricot jam with a little hot water, sieve and brush over the warm buns. Cool on a wire rack.